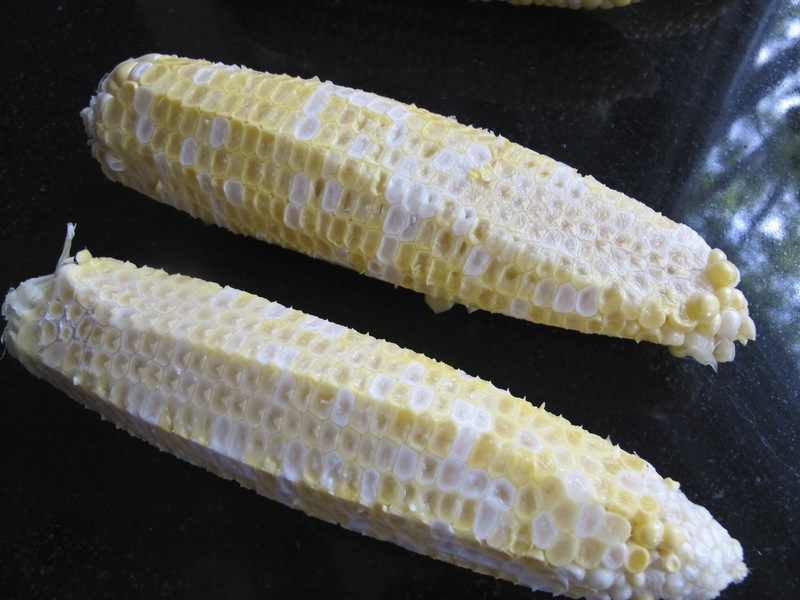 Fresh corn on the cob has been available in our grocery store recently. I don’t know where it comes from, because it certainly can’t be local, but throwing caution to the wind, we decided to give it a try. Unexpectedly, it was delicious. Good enough that I wanted to find a chowder recipe that used fresh corn. Searching the internet turned up numerous variations that appealed to me. I started with a recipe from Cooks Illustrated, and tweaked it to match what I had on hand. 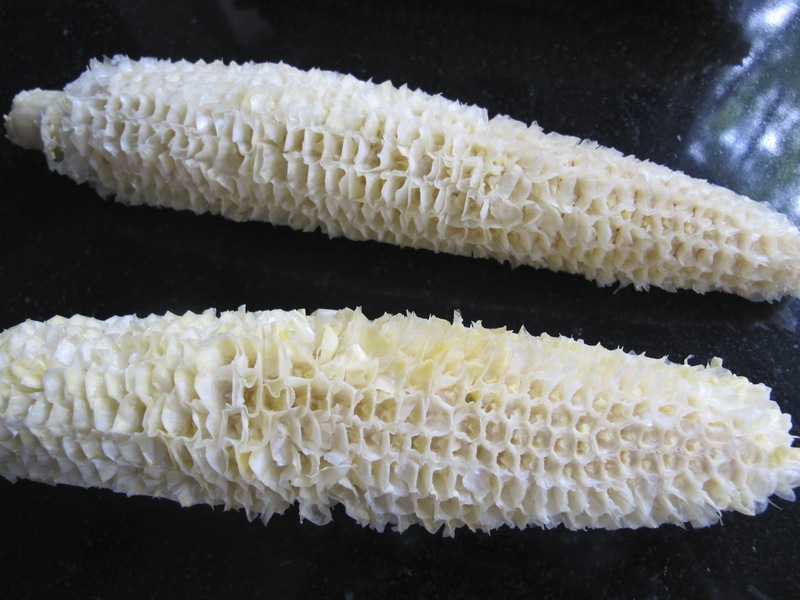 This is what the corn looks like to begin with, after cutting off kernels, and after scraping with a dull knife. 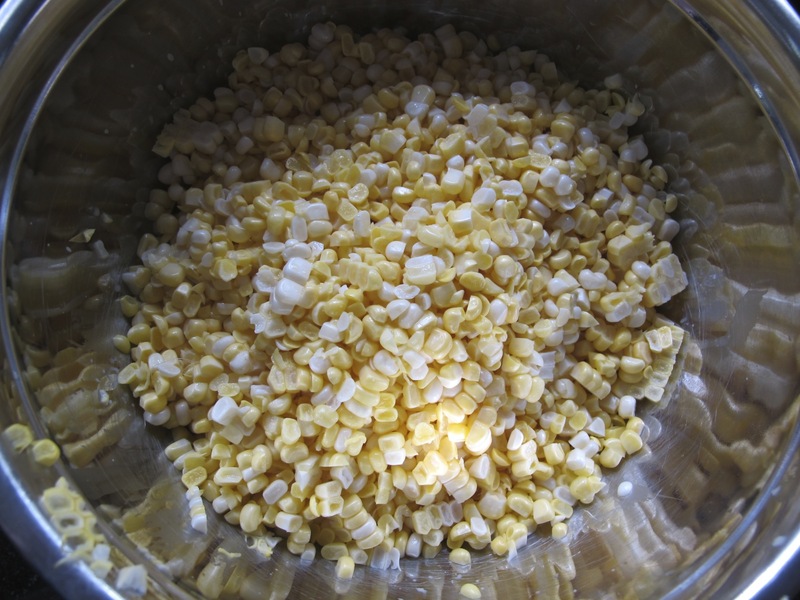 This is Peaches and Cream corn – yellow and white kernels. I should mention that this corn cutting and scraping is a tad messy. There was corn juice splattered all over the counter, the window ledge, the window, the sink (I tried to contain some of the spray by working in the sink – not totally successful) and of course, my glasses! In good weather, I would move this outside. Then I could just hose down the work area. The scraped corn was squeezed in a clean teatowel to extract the juice. I got a little carried away and started making a hole in my teatowel. Of course, it is a lovely linen towel that I have had for at least 30 years. Did I mention that I don’t like to throw things away? 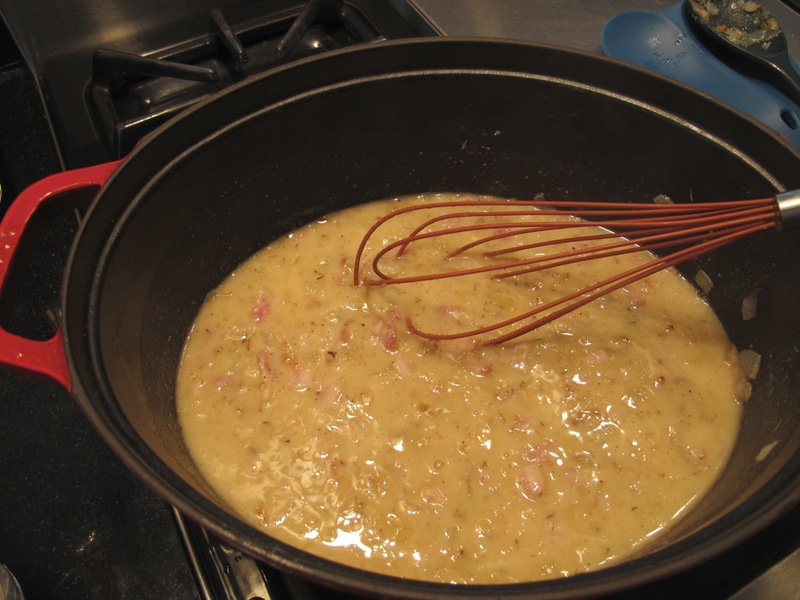 There’s the start of the soup – onions and bacon, flour added, and finally water whisked in. 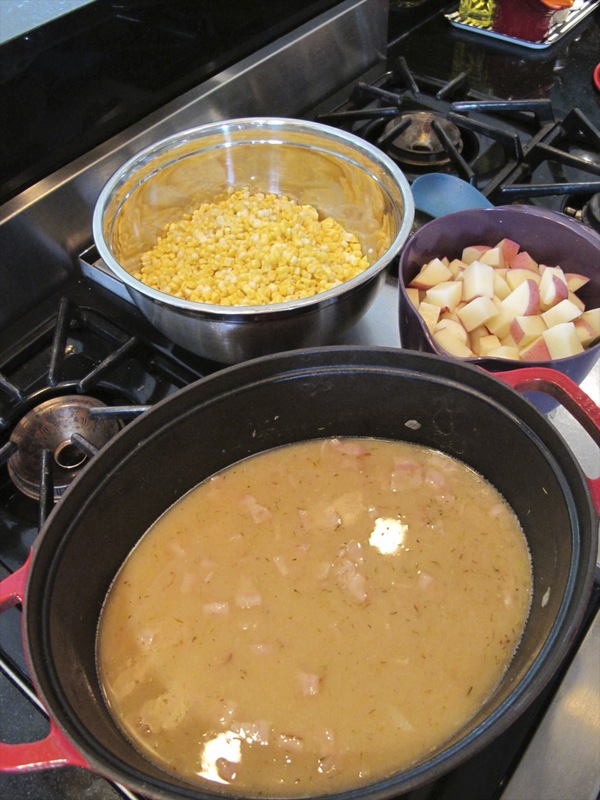 After the soup simmered a bit, it was time to add the corn and potatoes. Then after they cooked, some of the soup was pureed. 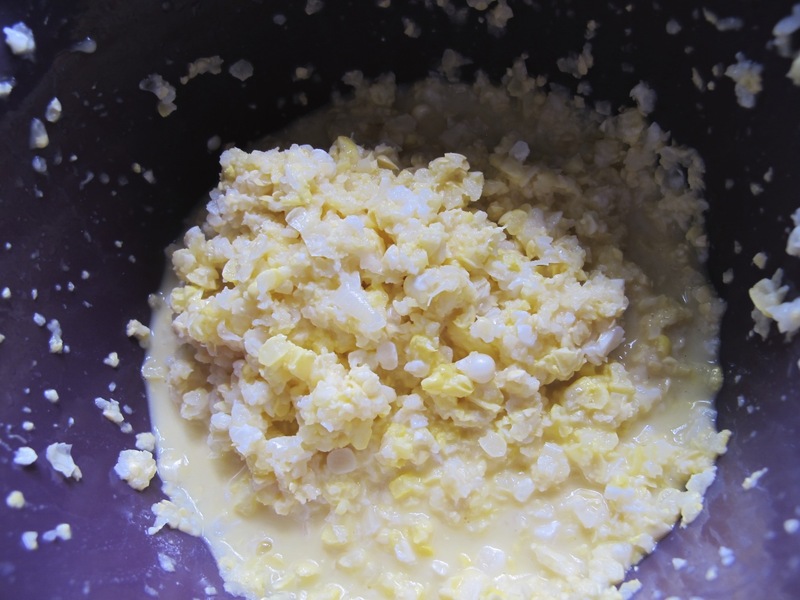 Cream was added and heated through, and finally the corn juice was mixed in. The basil garnish added another flavor component. I was carried away taking photos right up until the soup was ready. 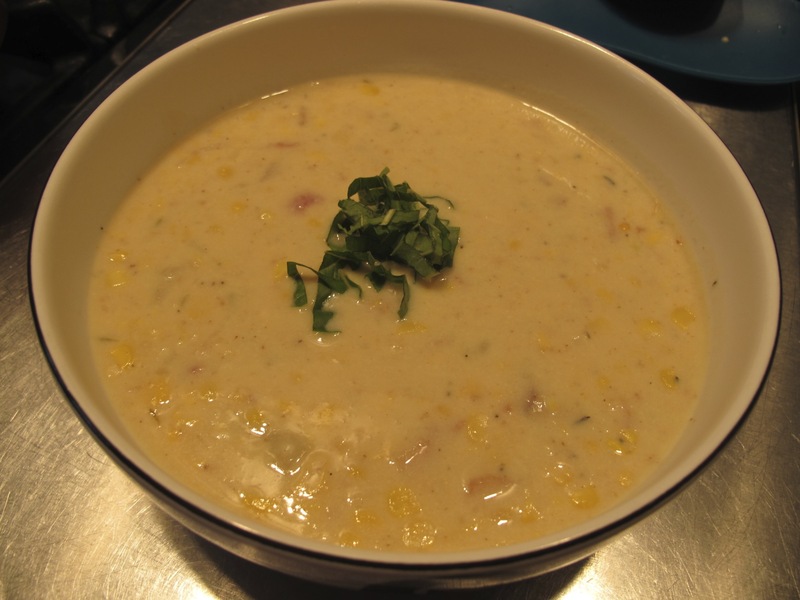 I’ve never made chowder with fresh corn before, and I was intrigued with the process. Also very impressed with the flavor. There was a lovely smokey taste from the bacon, and it wasn’t anything special. The soup, however, was very special. Yumm. Do not try to make this with anything but fresh corn. Trust me on this. Using chef’s knife or corn stripper, cut kernels from corn. Be careful to remove only the part of the corn kernel sticking out of the cob; cutting deeper will pull off fibrous material. Transfer the cut kernels (you should have 5 to 6 cups kernels) to a large bowl and set aside. Hold cobs over a second bowl and using back of a table knife, firmly scrape any remaining pulp on cobs into bowl. You will have about 2 to 2 1/2 cups pulp. Transfer pulp to center of clean kitchen towel set in medium bowl. 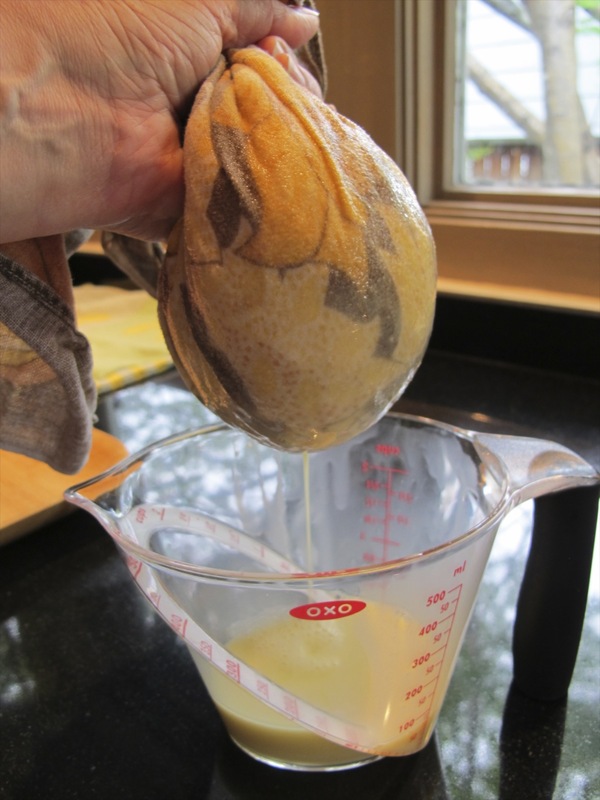 Wrap towel tightly around pulp and squeeze tightly until dry. 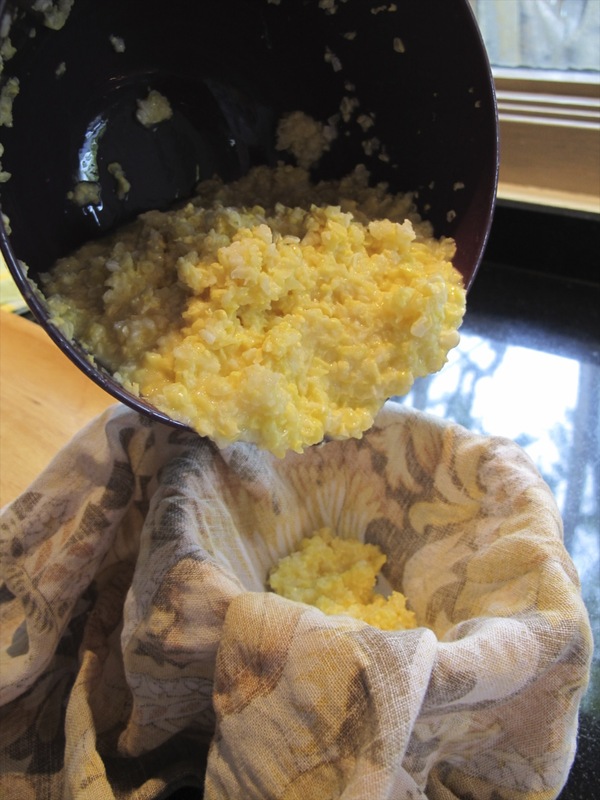 Discard pulp in towel and set corn juice aside; you should have about 2/3 cup juice. 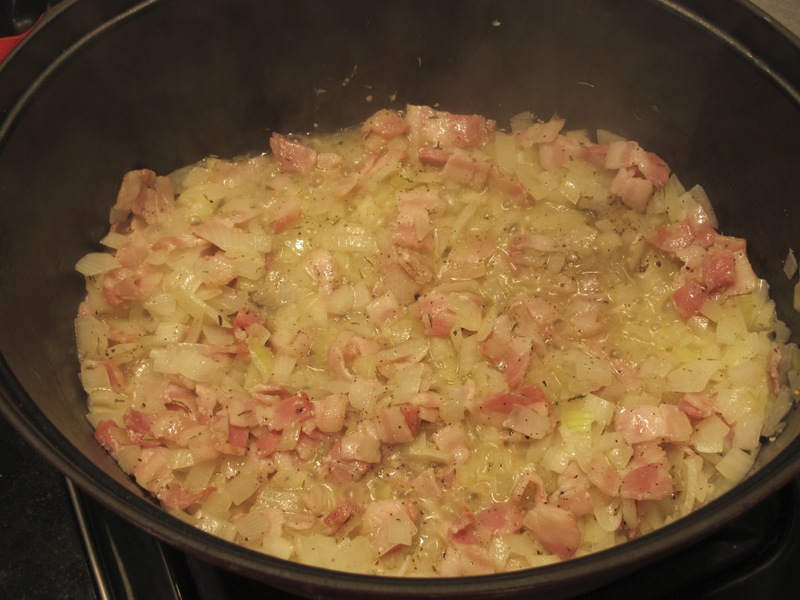 Melt butter in Dutch oven over medium heat; add onion, bacon, thyme, salt, and pepper; cook, stirring frequently, until onion is softened and edges are beginning to brown, 8 to 10 minutes. Stir in flour and cook, stirring constantly, for 2 minutes. Gradually add water, whisking constantly, and bring to a boil. Add corn kernels and potatoes. 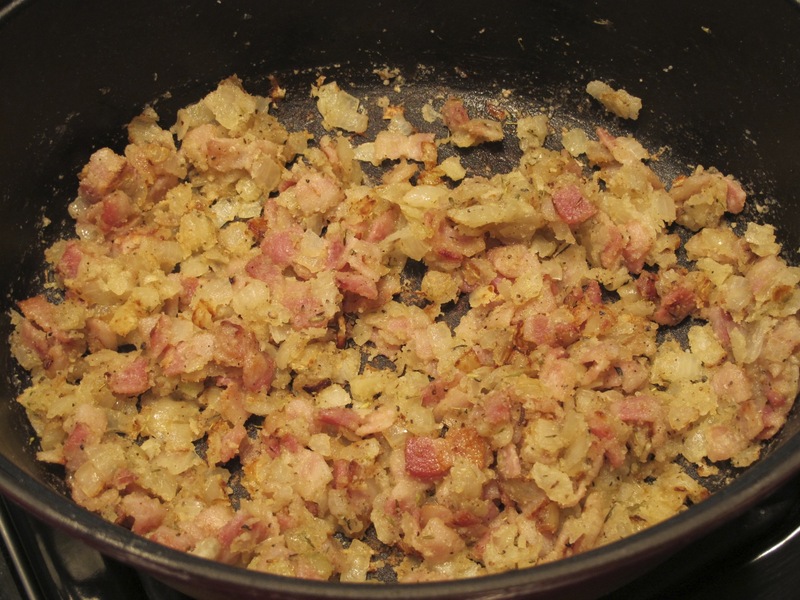 Return to simmer; reduce heat to medium-low and cook until potatoes have softened, 15 to 18 minutes. 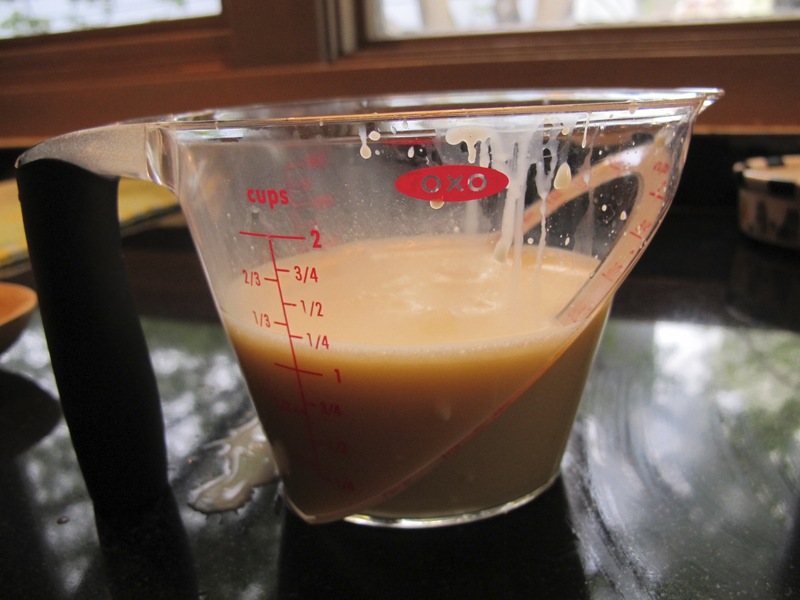 Process briefly with an immersion blender, 1 to 2 minutes. Add half-and-half and return to simmer. 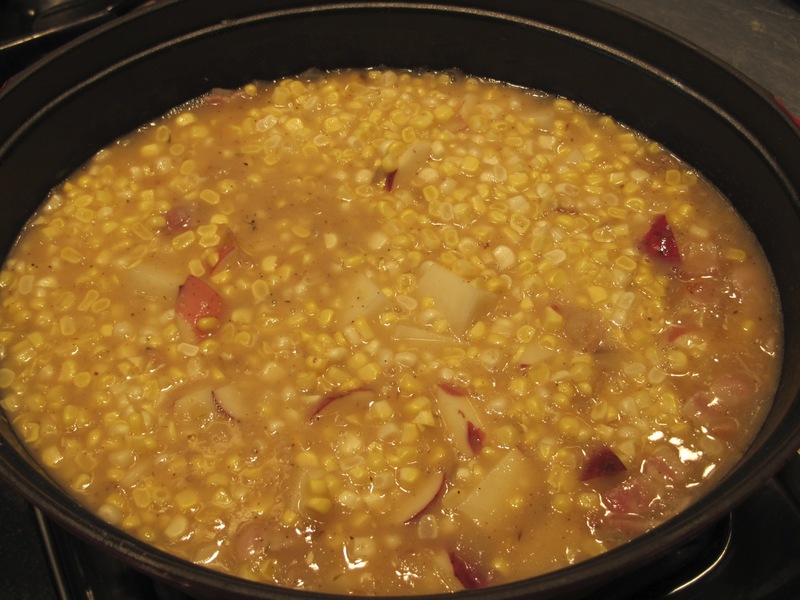 Remove pot from heat and stir in reserved corn juice. Season to taste with salt, pepper, and Sprinkle with chopped basil and serve. My leftovers are frozen – till the next cool and rainy day! Now that looks yummy. 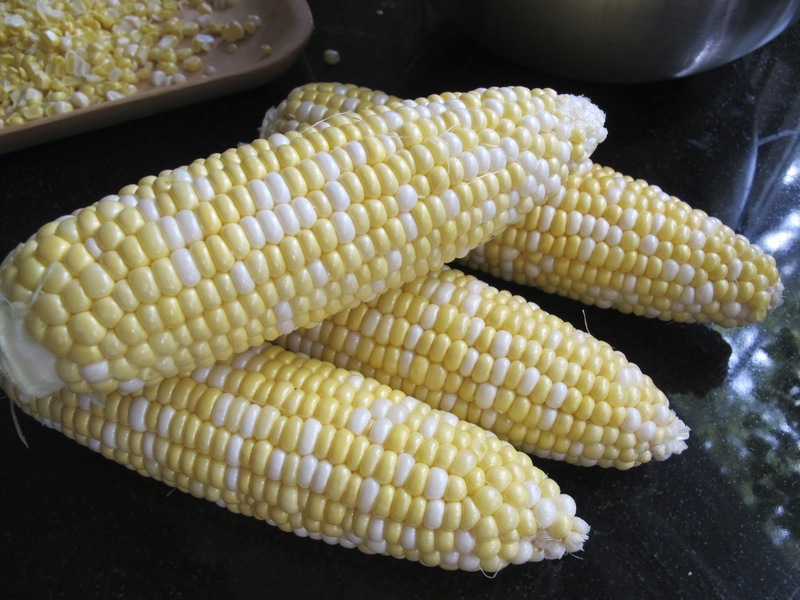 We love the corn season and often have corn on the cob for a tasty snack. 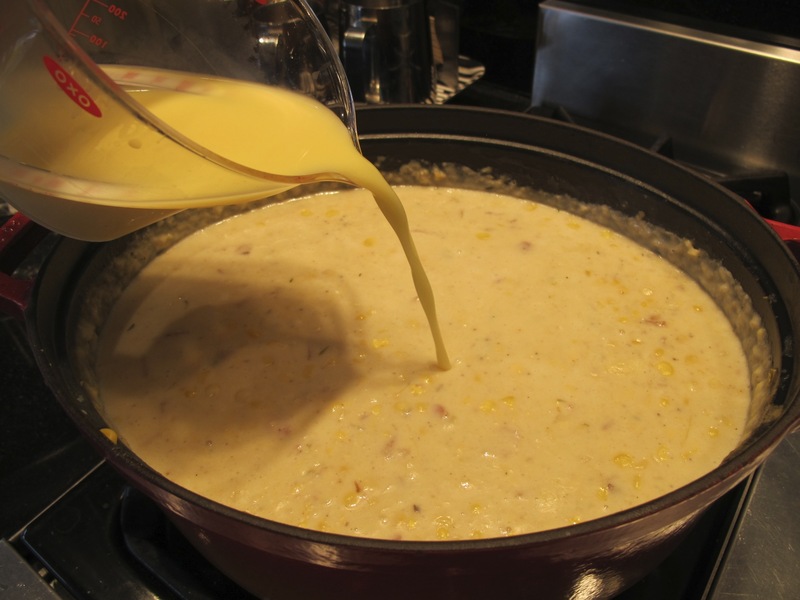 As a corn lover – you should try this recipe. It is so tasty! 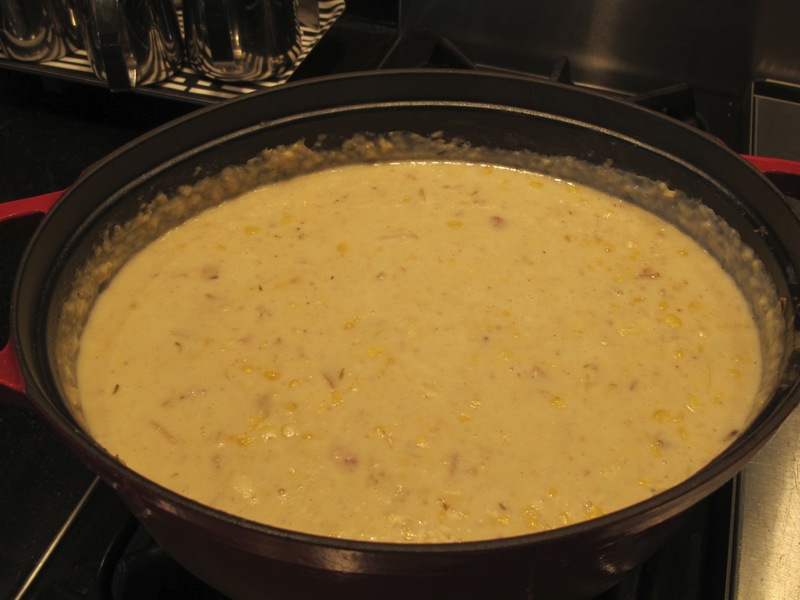 Corn chowder is on of my wife’s favorite dishes, I will bookmark this recipe to make for her. It was amazing. I will be making it again – anytime the corn is good! I haven’t had this in years … yours looks SO good!! Wish you could taste it! Oh wait, you can – just follow the recipe. It was a bit tedious doing the corn, but so worth it!